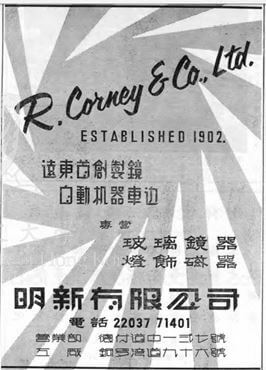 Established in 1902 (although not formally incorporated til 1921), R. Corney & Co Ltd (明新有限公司) was a leading glass merchant and mirror manufacturer in Hong Kong which produced glassware, mirrors, light fixtures and other glass-related products. Despite its long history, limited information is available about the firm. A R.Corney ad from the Rosenstock’s Directory of China and Manila in 1909 includes the following descriptions – “the premier beveling and silvering work in the East”, “plate and sheet glass importers with the largest stock in the East”, “Advertising Mirrors a Specialty – Any size or shape required”, “Gilding and signwriting -Old Mirrors Resilvered” and “Export orders receive careful attention”. Its location was listed as “Causeway Bay, near the Polo Grounds”. In the 1955 ad from the HK Building Contractors Yearbook, shown right, the company claims to be the first glass manufacturer in the Far East which polished glass edges using machines. Its sales office was listed as 127 Des Voeux Road Central while its factory was located at 96 Tung Lo Wan Road in Causeway Bay. It is unclear whether there was a “R. Corney” but based on court filing, three Chinese families – Lau, Sin and Lam – were involved in the founding of the firm. The most prominent of the three founders was Lam Woo (林護,1871-1933), the prominent contractor, philanthropist and backer of Sun Yat-sen while more info is required about Mr. Lau (we know he was a native of Zhongshan) and Mr. Sin, both presumably Chinese Christians who lived in Australia before settling in Hong Kong like Lam. By the 1940s, R. Corney was managed by Sinn Pui-kwan Hoe (aka P.K. Hoe, 冼培坤, 1892-1960), a member of the Sin family. According to his obituary, P.K. Hoe arrived in HK at the age of 14 to study at the Kadoorie School. He later joined his uncle in Australia before returning to HK to join R. Corney. He was a director of the Chinese General Chamber of Commerce and Tai Hang Kaifong Welfare Association and the vice chairman of the Confucian Society. In 1950, he and his wife decided to relocate to Sydney where he eventually died a decade later. He was succeeded at R. Corney by its deputy managing director, William Iu-Shue Lau (劉耀樞, 1902-62), a graduate of Lingnan University and University of California and likely the eldest son of one of the firm’s co-founders. William Lau was married to Sue Lam (林遂恩, 1902-80), a daughter of the firm’s other co-founder Lam Woo. 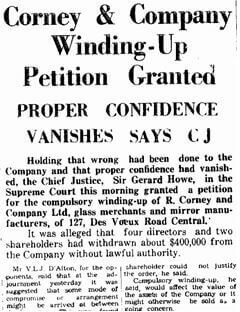 In 1951, a dispute arose between the three families when two members of the Lau family who were members of the board – LC Lau and Paul Lau (brothers of William Lau) filed a petition to have the company wound up as they alleged that 4 directors and 2 shareholders withdrew $400,000 from the company without lawful authority. The petition was granted but ultimately the firm was not wounded up. By 1955, Paul Lau was elected chairman of the firm while L.C. Lau served as its managing director. Paul Lau (1914-1998), whose full Chinese name was Lau Yiu-pong (劉耀邦) went by the name Lau Pong (劉邦), which was the same Chinese name as Liu Bang, the founder of the Han Dynasty. After graduating from Lingnan University in Canton with a degree in chemistry, Paul ventured to Shanghai where he established the exclusive bottler of Green Spot soft drinks for Northern and Eastern China with his friends. When Shanghai fell to the Japanese, Paul returned to HK to join the family business. In addition to Corney, he was also involved with National Lacquer & Paint, the maker of Camel Paint and served as its deputy managing director. L.C. Lau (劉龍鏘, 1906-1973) was an art lover, so much so that he even established an oil painting department for R. Corney to import oil paintings from Europe and promote local painters. His wife W.Y. 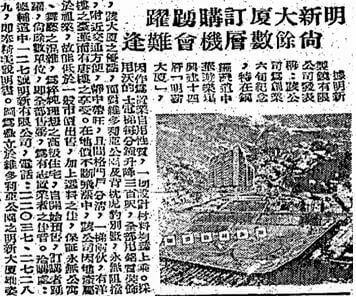 Fok (霍媛瑤), who was also a director of Corney, is the daughter of Fok Chi-tang (霍芝庭), who once held the gambling monopoly in the Guangdong province before acquiring the majority control of Bank of Canton in Hong Kong. At its 60th anniversary in 1962, R. Corney under the leadership of the Lau brothers decided to re-develop its factory site at 90-96 Tung Lo Wan Road in Causeway Bay neighboring Victoria Park into a 14-story residential building. The factory was relocated to 72-78 Pan Hoi Street in Quarry Bay. In 1973, L.C. Lau died and was survived by 2 sons (Daniel and Jerome) and 2 daughters (Kin-yue Lau Fu is co-founder of Chinese International School, Christina Lau Chan is founder of St Catherine’s International Kindergarten) and Paul Lau died in 1998 with no children. Today, the company is still in existence but is primarily a property holding company.